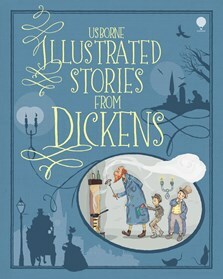 A beautifully illustrated collection of five classic Charles Dickens' stories, retold for younger readers. Includes ‘Oliver Twist’, ‘Bleak House’, ‘Great Expectations’, ‘A Tale of Two Cities’ and ‘David Copperfield’ as well as a short biography of the great author himself. With internet links to find out more about the life and times of Charles Dickens. Illustrated Stories from Dickens, richly illustrated by Barry Ablet, brings the clothes, artefacts and Victorian surroudings of the characters alive on the page. My favourite books in this are Oliver Twist, Great Expectations, A Tale of Two Cities and David Copperfield. The pictures are great and the stories are really interesting too. I didn't know that Dickens had also written A Christmas Carol, so I am going to buy that next. (Guy Robertson, aged 6, Australia).